Israel closes Holot detention facility, releasing those who promise to leave the country ahead of mass-deportations. 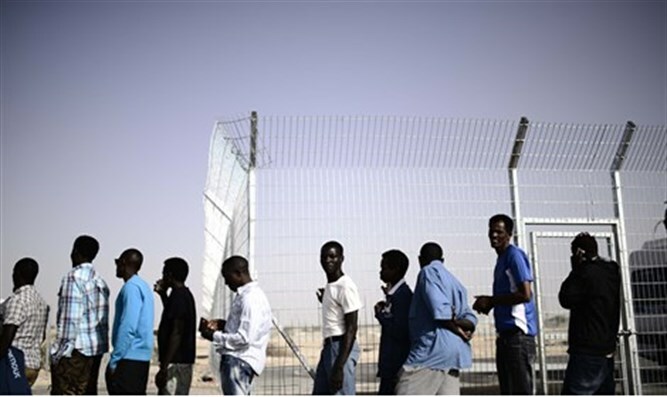 Israel has closed a desert detention center for illegal infiltrators as part of a plan to remove thousands of Eritreans and Sudanese who entered the country illegally, officials said Thursday. Immigration authority spokeswoman Sabine Haddad told AFP that the Holot facility closed the previous afternoon, ahead of a midnight deadline. Israeli Prime Minister Binyamin Netanyahu in January announced implementation of the program to remove infiltrators, giving them a choice between leaving voluntarily before March 30 and receiving a plane ticket and $3,500 (2,900 euros), or facing indefinite imprisonment with eventual forced expulsion. Since then, some Holot inmates have been transferred to the nearby Saharonim prison. Others who had submitted asylum requests before January 1 were released pending a decision, Haaretz newspaper reported. Haddad said that 300 had been freed after agreeing to leave the Jewish state. Those set free were barred from living or working in seven cities with high migrant populations, including Tel Aviv - where most are concentrated --Jerusalem, and the Red Sea resort town of Eilat, she said. Holot, an open facility where inmates were free to leave during the day but had to return at night, was opened in 2013 with the aim of siphoning infiltrators away from the cities, the immigration authority says. As some of the infiltrators could face danger or imprisonment if returned to their homelands, Israel is offering to relocate them to an unnamed African country, which deportees and aid workers say is Rwanda or Uganda. Infiltrators began entering Israel through what was then a porous Egyptian border in 2007. The border has since been strengthened, all but ending illegal crossings. According to Interior Ministry figures, there are currently some 42,000 African infiltrators in Israel, half of them children, women or men with families. Women, children, and families will not be transferred to a third country the current plan. Refugees or and asylum seekers will also not be deported. Out of 42,000, only about 5,000 filed requests for asylum, and only handful of those requests fit the criteria set out by international law.